We're kicking off a globe-trotting weekend of food in Burma. Or Well Street, to be precise. Dine with Kyi (by Burmese babe Thuzar Kyi) is hosting a two-day take-over at the Well Street Kitchen for a Burmese Street Kitchen meal. She's billing it as a "contemporary picnic" and we have to say take-out from M&S for the park never looked this good. Pork salad wrapped in lettuce, mutton curry puffs, tamarind chicken in a bun and mango panna cotta are just some of the delights to get stuck in to around the communal table - all part of celebrating the social side of Burmese culture too. Tickets cost £28 from here, and Facebook details are here. You might think you're just taking a stroll over to Wilton Way, but once through the doors of Mayfields, you'll be transported to Thailand via the handywork of the guest chef for the night, Andy Oliver. Hyped as cooking "the best Thai food outside of Thailand", Andy has worked at Nahm in London and the cult restaurant Bo.lan in Bangkok - voted one of the top 50 restaurants in the world. For Andy's Som Saa takeover, expect mouthwatering sensations like prawn and pork caramel on a bed of green guava, grilled chicken and chilli jam salad and for dessert, condensed milk, fermented rice ice cream with strawberries and lemon basil. The event kicks off at 3pm, tickets are £35 and places can be booked by emailing reservations@mayfieldswiltonway.co.uk or on 0207 254 8311. It's French independence day today, but we're sacking off steak frites and going Chinese instead with Mei Mei's Chinese BBQ. 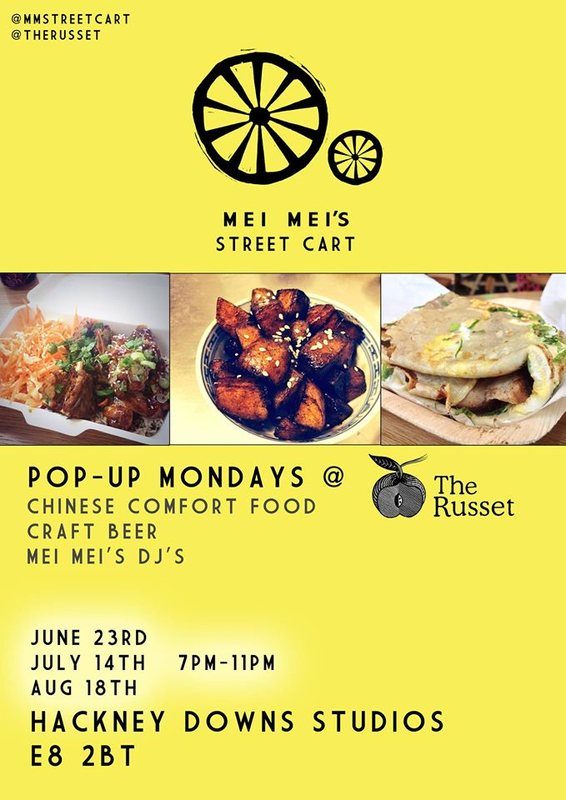 The street cart favourite rolls into The Russet for one night only and will be offering tasty marinated meats and skewers, including Xinjiang cumin lamb ribs, smashed garlic wings and wild Chinese mushroom skewers, served with sesame rice and Tsingtao brined pickles. The event's not ticketed, so feel free to roll up with cash for food and some of that craft beer that we know you all love. All the deets here.